Most of what we know about ADHD is that it can lead to trouble in school. We think of fidgety, restless kids (usually boys) who can’t pay attention. 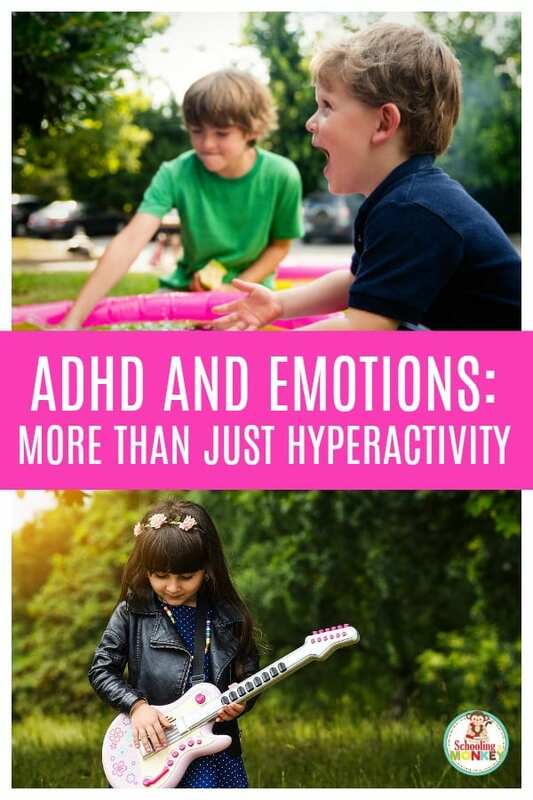 Not only can ADHD affect girls (and boy does it in our house! ), but there are a lot of other misconceptions about kids with ADHD, too. One of the biggest misconceptions is that ADHD is “just” an attention problem. Teaching a child with ADHD requires an acknowledgement and acceptance of these misconceptions and difficulties. 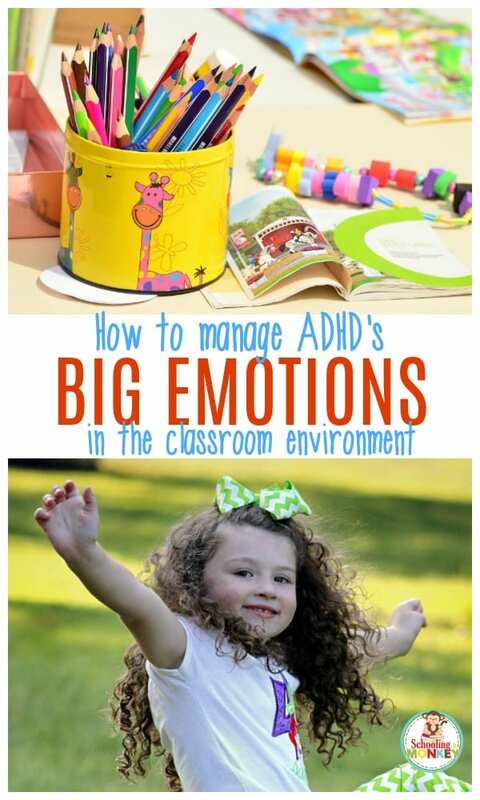 ADHD and emotional outbursts can ruin any teaching experience with a child who has ADHD. The hardest part of ADHD that I have had to accept (both in my daughter and myself) is how emotionally draining it can be. Some days, teaching ADHD children will put both of you through the mental and emotional ringer. It was not I started looking into officially diagnosing Monkey with ADHD that I realized that emotions were so closely tied to the disorder. I was reading some articles about the diagnostic criteria for ADHD and found that it was only recently that emotional disruption was removed from the official diagnostic criteria. However, recent studies indicate that about half of children diagnosed with ADHD have trouble regulating their emotions. Children with ADHD are usually incredibly impulsive (part of their hyperactivity). The impulsive nature causes a child or adult with ADHD to act on whatever emotion they feel at the time with full-blown intensity. 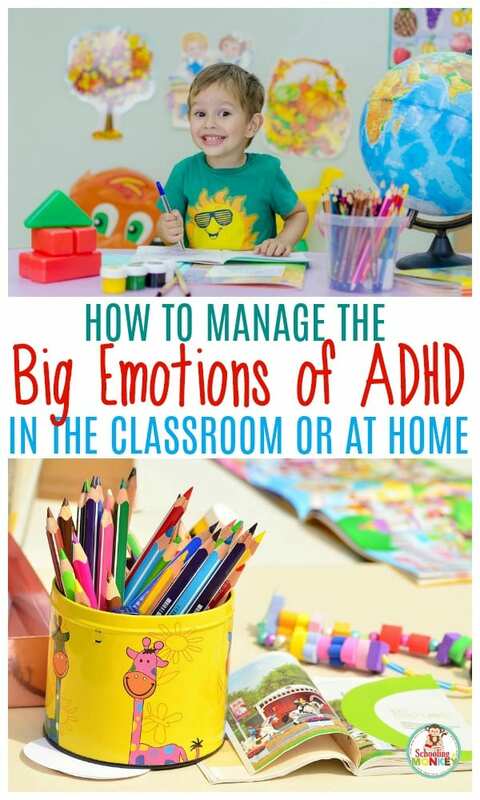 If you want to learn more about teaching ADHD in the classroom, read about these essential classroom tools for ADHD, classroom-friendly fidgets for ADHD, and why kids today are out of control. Child didn’t get the pencil they wanted? Angry outburst with shouting, stomping feet, and slamming doors. Didn’t instantly grasp a new concept? Child questions entire existence and ability to function as a human. They will end up living under a bridge and will never graduate current grade. Child has to do extra work? You are clearly the worst parent and teacher who has ever lived. On the flip side, if you give an ADHD child an unexpected day off, you are the best mom ever and they would probably throw you a parade if given a chance. Why does a child with ADHD have emotional outbursts? It’s all in how ADHD is processed in the brain. According to studies, about half of children with ADHD struggle with emotion control. Many kids with ADHD (and girls especially) have trouble with working memory. This allows momentary feelings to “take over” the brain, flooding the child with whatever current emotion they are feeling. The emotion acts like a virus, and completely takes over the child’s brain. This causes the flight or fight response to be triggered for every feeling, which contributes to extreme outbursts over what seems like little things to a person without ADHD. This part of ADHD, the part no one ever talks about, is the difficult part of ADHD. 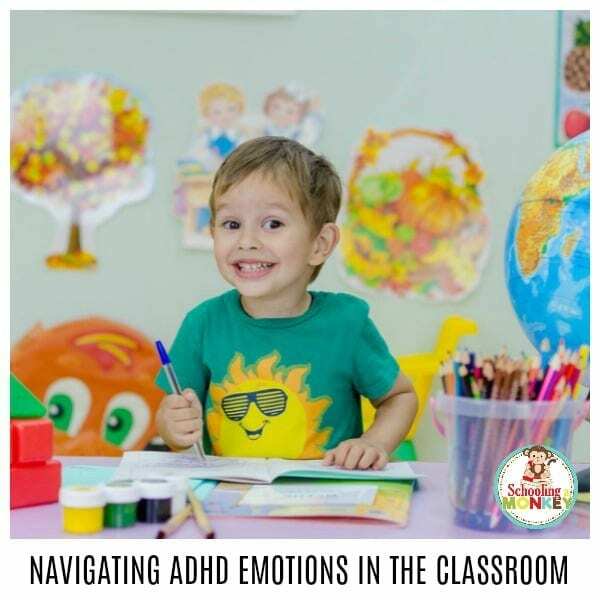 There are plenty of ways to help a child with ADHD focus, but the emotional ups and downs are something the child will struggle with throughout life and will largely have to learn how to deal with it on their own. It was not until I hit my late 20s that I felt like I could effectively manage my ADHD-fueled highs and lows. So, what is the best way to deal with the ugly side of ADHD as a parent or teacher? You cannot allow your emotionally-charged child to rule the house or decide they don’t need to learn. I certainly don’t have it all figured out, but I found a few strategies along the way that have helped us get through the roughest days of teaching a child with ADHD. Kids are easily overwhelmed with work if they have ADHD. 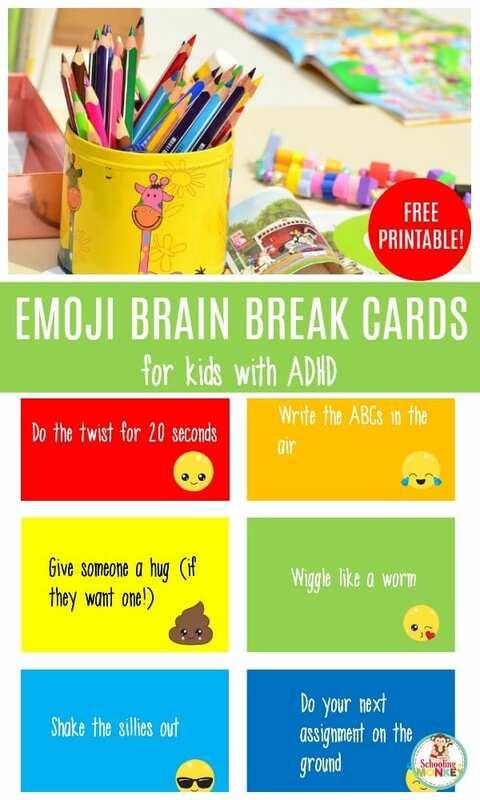 One simple way to help a kid with ADHD reset is to implement brain breaks. These 60-second or less activities help reset a child’s brain and gets her out of the flight or fight mode. You can use these at home or in the classroom! My kids and I have a bit of an awkward situation going on because we are all impulsive. When I give Monkey something to do that she doesn’t like, her initial reaction is to get upset. In response, my initial reaction is to get upset right back. Naturally, this is a terrible cycle that cannot be allowed. It’s the oldest trick in the book, but taking a few seconds to breathe is the best way to keep a calm exterior. Getting upset at an already-upset ADHD child does as much good as throwing water on an electrical fire. So, if your ADHD child says something upsetting, don’t react in anger. Take a few extra seconds to breathe and remember, they are only responding with their gut instinct. It takes years to learn to control this response, and it really is an incredible challenge for a child with ADHD to not say the first thing that pops in their head. If you must, leave the room for a few seconds to calm down and then come back (but try not to get angry when you come back in and see that your child has transformed the school area into a fort complete with pencil rockets). I don’t know what it is like to parent a child who doesn’t have ADHD, but even coming from an entire family of ADHD kids, I still had too-high expectations for my children. I was raised in a culture where parents were instructed to “spank the devil” out of kids, which does work in a way, but at an incredibly high cost. Our family chooses to use non-violent parenting methods, which includes extending a lot more grace to children when they make mistakes. My children will never excel in school because I force her to. If she excels in school, it is because I give her the tools she needed to succeed on her own. In general, if you are teaching a child with ADHD, pressure and force will never work. Their response will be to cling to their resistance even harder, and then you are in a huge power struggle where no one wins. Once you realize that your ADHD child isn’t deliberately trying to anger you or be defiant, it becomes a lot easier to let impulsive behavior go. These outbursts are simply your child telling you that they are unhappy with a situation, not you personally. Teaching a child with ADHD takes a tough skin. Your relationship with your child is extra complicated because you have the role of teacher and parent. Any emotional conflict from one area will spill into the other. I like to imagine myself as a duck. Hurtful things said during school roll off my back like beads of water. I am not causing my child to be upset, even if emotions are directed at me. And if you do find yourself getting upset, refer to the breathing step above when homeschooling a child with ADHD. As mentioned previously, it can (and will) take years for your ADHD child to learn to fully control their emotions. Outbursts will be common through the teen years. However, you can help your child learn emotion control by practicing when your child is of sound mind. Wetalk with Monkey about acceptable responses for if she feels upset, angry, sad, disappointed, or scared. The breathing technique is also a good one for a child with ADHD. Sometimes, just one big breath is enough to keep an outburst away. Previously, I mentioned how important routine is for the ADHD child. Monkey usually gets the most upset when her routine is thrown out of balance. She is old enough now that we can sometimes talk through her emotions at the time. I’ll let her know why we had to change schedule and let her pick how she implements the changes. For example, if we have to do two math lessons in a day, I let her pick if she wants to do them both at once or do one in the morning and one after other subjects have been completed. When she feels in control, her emotional response is not as high. Sometimes, the best thing to do is take a break. You can either try to introduce the concept in a hands-on way, or just skip that lesson for the day and come back again the next day. Teaching a child with ADHD is a challenge, but you can make it work. Read the rest of the posts in the teaching ADHD series!